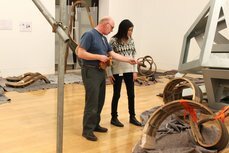 Swell, ripple, undulate and flow: these are just a few of the gut-feelings that emerge when in the presence of Richard Deacon’s wooden sculpture After. Looking at the nearly 10 metre-long floor-standing sculpture, there’s an irresistible urge to imagine yourself as a tiny nimble figure, sliding across its perfectly proportioned planes and smooth strips of wood, as if riding the crest of a giant wave. There’s something honest and yet hearty about this sculpture. Its undulating wood mixes rigidity with movement, making a shape suggestive of nature’s various forms in plant, animal or man. Robust, dynamic and lively, there’s a new view at every curve. You could say it’s his unique method of manipulating ordinary material that makes the ordinary extraordinary. I’ll leave that up to you to decide - but personally, I’m a big fan of the make-believe.